Boat Description If you dont need quite as much boat, but still want quality and enjoy the cruising lifestyle, then consider these two Quicksilvers, each with their distinctive new beige-coloured hulls and burgundy highlights. More beam than before gives more room in the cockpit and cabin. 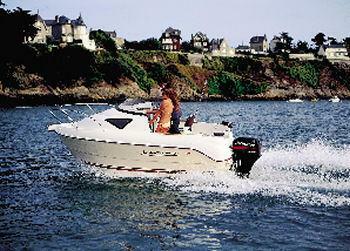 Theres a choice of four-stroke or two-stroke outboard power. The 510 Cruiser and 460 Cruiser include sleeping accommodation below and an ergonomically designed cockpit with enough room to enjoy fishing over the side, lounging around or taking lunch. The 540 Cruiser even features a standard sunpad. These boats have it all. Engine Notes There’s a choice of four-stroke or two-stroke outboard power.